A science-fiction action game set in distant future in the titular world, where a long time ago a mysterious substance was discovered, that allowed for substantial increase of capabilities of living organisms. In the wake of this discovery, the place soon was turned into fertile ground for rivalry among numerous criminal organizations aiming to seize control of the deposits, and in the long run of the entire galaxy. The player fights large-scale battles involving two factions, where a wide variety of futuristic firearms as well as melee weapons can be used. The multiplayer mode (which is the core of the game) was designed with asymmetry in mind, for each of the two factions involved in the conflict has completely different abilities and weapons. As a result, controlling each of the teams provides vastly different experience, but it also requires the player to apply unique tactics. 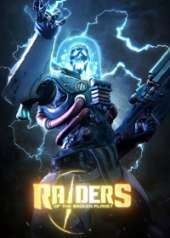 In Aug/2018, the game title was changed to Spacelords and was made free-to-play with previously purchasable campaigns available to everyone.